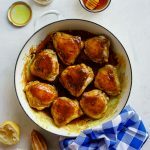 Sticky lemon turmeric chicken thighs baked in a honey, lemon and turmeric glaze is the perfect easy weeknight dinner served with greens. 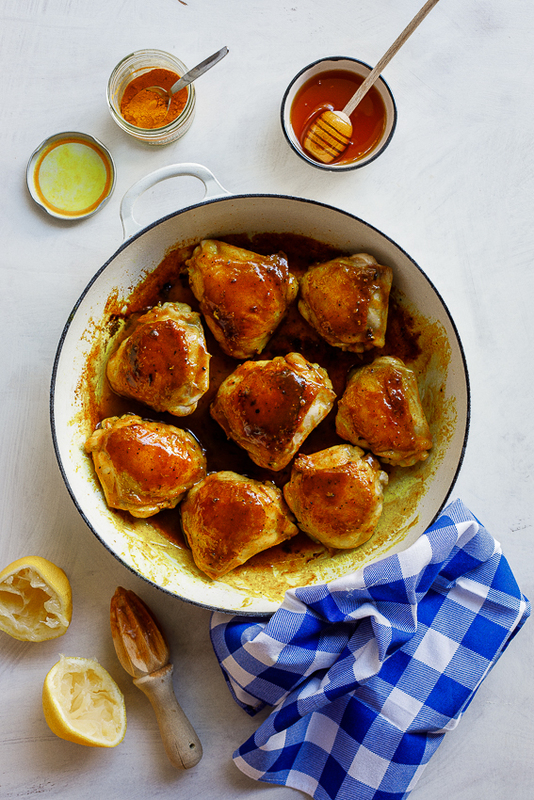 Those of you who have been reading Simply Delicious for a while will know that I am a serious fan of one-pan chicken dishes. 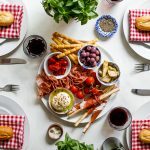 It is what I feed my family when I have zero inspiration and even less time and it is what I fall back on weekly when faced with the dreaded “what are we eating for dinner?”. It’s safe to say the Ryders pretty much run on easy chicken dishes, salad and the odd creamy pasta dish or two. There has been much talk lately of turmeric and all its many health benefits. Turmeric is something I have loved cooking with for the longest time. Mostly because it gives food a really gorgeous yellow glow but also because I really like its earthy flavour and aroma. Mostly, though, it’s just been an extra I add to my curries. But I’ve been experimenting with it more and more and I have to say, this easy turmeric chicken recipe is one of my favourites. I love that I can do everything in one pan and that my kids always ask for seconds. Plus we have the added benefits of the turmeric with all its anti-inflammatory properties and the lemon’s alkalising goodness. I mean, we’re pretty much healing ourselves while we eat. That’s my story and I’m sticking to it. 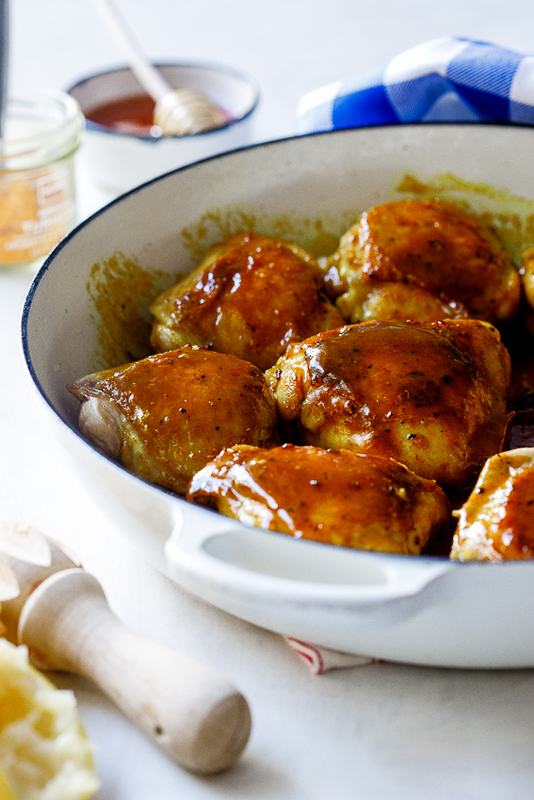 Have you tried this lemon turmeric chicken recipe? Leave a comment and rate below! 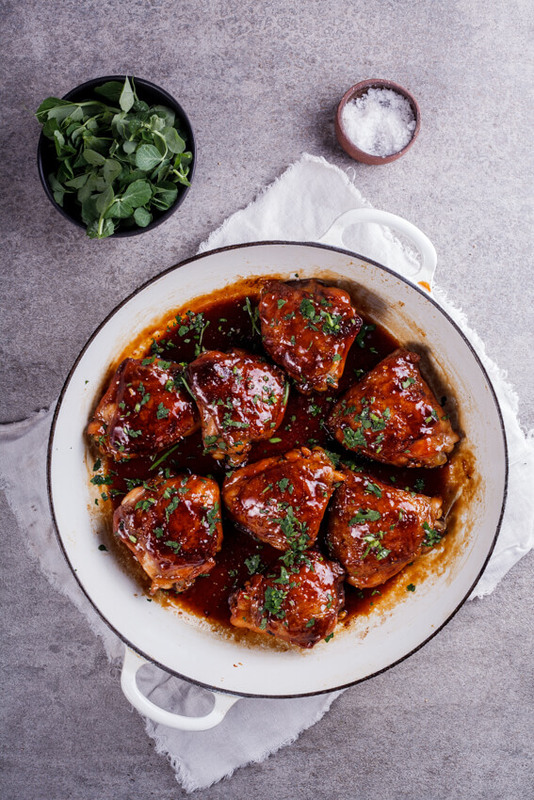 Brown the chicken thighs in an oven-proof pan on both sides, seasoning generously with salt. Combine the honey, lemon juice, pepper, turmeric and curry powder and mix well. Pour the turmeric mix over the chicken and place in the oven. Allow to cook for 30 minutes, basting with the glaze every 10 minutes until the chicken is cooked through and the glaze has thickened. The recipe looks absolutely delicious! I have one concern though…will the turmeric and the curry powder permanently stain the inside of the LeCreuset pot? It would be helpful to know in advance if it does so I can use another pot. Thanks! What temp would you recommend in F – like 400* F? Also, how much garlic/ginger/soy would you suggest? Could you add after the glaze thickens? Yep, 400 should be perfect. I would do a teaspoon each of crushed ginger and garlic and a tablespoon or two of soy. I would add it with the the other glaze ingredients so the garlic and ginger can cook through. In the photo the thighs look like they have their skins on. Am I right, that you don’t remove the skins before baking? Are they bone-in, as well? Yep, skin on and bone-in. This results in the best flavour, in my opinion. It looks delicious! Healthy too!! I’m a huge lemon chicken fan. Thanks Jason. It’s definitely a winner! Just made this tonight. It was delicious. I added a splash of soy sauce and fresh garlic and it worked. My husband loved it and so did the kids. Thanks so much! I love the addition of soy to this! So glad you and your family loved this recipe Monica. Made this dish this evening. Really enjoyed it. A bit “earthy ” in flavour with the turmeric. Next time, which will be soon, I’ll add some fresh ginger and a touch of garlic. I might also leave out the curry powder . The turmeric is very earthy but I quite like it. This would be fantastic with added ginger and garlic and the curry powder will go quite nice with that as well. Will turn it into more of an Indian curry kind of a dish which will be delicious. Does it really finish cooking with the 200 degrees oven? Yep, 200 degrees Celsius so around 390 fahrenheit. It’s 200c. You may have to google, but I think that’s 375-400f. Can chicken drumsticks be used instead? Loved the recipe. I used bone in chicken breasts and baked them. They stayed moist, and were a big hit. I’m so glad to hear that Julie. Love the idea of using bone-in chicken breasts. You totally had me at lemon turmeric glaze ~ yum!! This recipe looks delicious. I only have chicken breasts at th moment. Could I make this with chicken breasts instead? Thanks Jennifer. Absolutely. I wouldn’t bake it though. I would cook the chicken breasts in the pan until they are 80% cooked then add the glaze and just keep it on the stove top, basting with the glaze while cooking the last little bit. Baking it might dry out the chicken breasts too much. I loved it! My kids couldn’t get enough either and I even had the leftovers the next day for lunch. Excellent recipe! That’s great to hear Jennifer. I’m so glad you and your kids loved this recipe. How easy is that! And it looks so tasty. Thanks for sharing Alida. It is SO easy. Thanks Jo-Anne! I love how simple this recipe is. I have all these ingredients in my pantry and fridge so guess what’s for dinner tonight? It really is Theresa! I hope you love it. Let me know what you thought! We loved this recipe Alida. 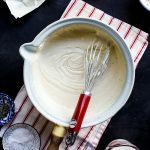 It will be making a regular appearance in my kitchen because it is so easy and really tasty. I’m so glad to hear that Theresa. It definitely is such a great recipe for busy weekdays. We are very much alike Alida! Easy one pan chicken dishes are served up quite often at our house too! This lemon-turmeric glaze sounds so light and delicious. I can’t wait to try! I’m in good company! 🙂 Thanks Mary Ann. This is a new staple in our house.